I shot way too many photos during my stay in Reinfeld. I stayed there from winter over spring to the summer, and it was really fantastic to see how everything changed in the course of the seasons. The winter was ok but when the colors of the spring showed up it became even more interesting, and the start of the summer was pretty awesome there. In retrospect, I would say that Reinfeld is a very beautiful place, especially in the warmer seasons. The photo in this post was shot when summer started. 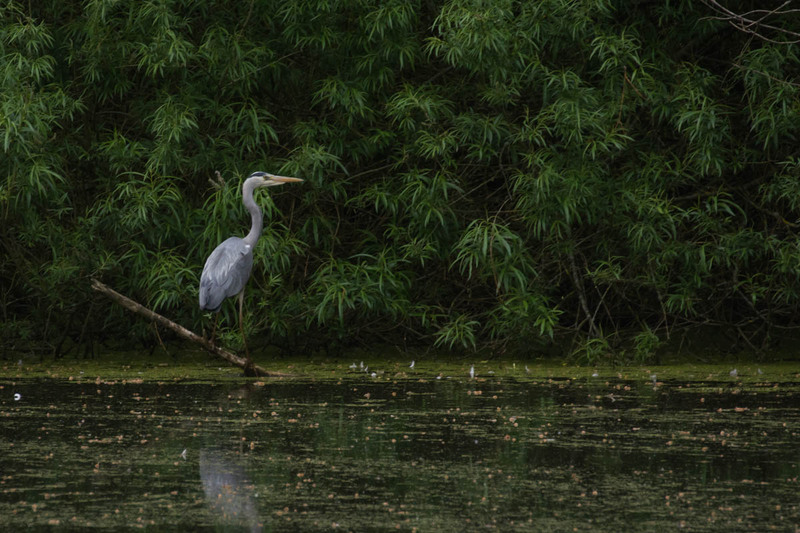 I was hiking through one of the forests with my cousin, and there was a hidden pond where we had a short rest, and suddenly a grey heron was landing in front of me behind the pond. With hand gestures I tried to tell my cousin that there is something he should see, but he was behind an uprooted tree and looked for an animal he heard under the roots. He came too late to see the heron, and I didn’t see the fox my cousin saw. I could however show my cousin the grey heron on the camera screen and at home when I transferred the photos to my computer. Even if the forests are smaller in North Germany and especially around Reinfeld, if you hike through them in summer, they sometimes don’t even look like German forests at all, as in the photo of this posts they sometimes make you think you are hiking through the Amazon rainforest. I hope you enjoyed the photo of the grey heron. You can find more bird photos on my blog if you like. Nice photo Dennis. I like the angled branch and the reflection of the heron in the water. These are the rare moments when you are in the right place at the right time. I actually wanted to show my cousin this part of the forest but didn’t expect a landing grey heron at the hidden pond. I would have expected a heron somewhere else but not there 🙂 Too sad that it was just like 20 seconds and my cousin couldn’t see the bird in real. The heron was landing on this branch or slightly behind it, and you’re right, the reflections are interesting. This is by the way one of my favorite photos from Reinfeld, and the moment at the pond with the heron was really good. I will edit another one of this scene sometime, I still have some photos where the grey heron flew away.